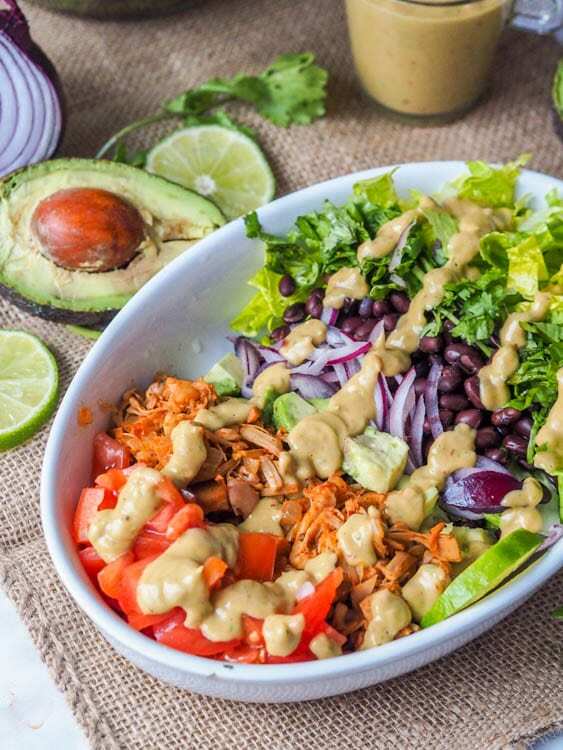 Jackfruit Pulled Pork Southwest Salad with Avocado Lime Dressing – A super filling vegan and gluten free healthy and nutritious Southwest salad. 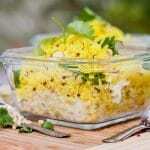 This recipe calls for shredded jackfruit which makes a perfect plant based substitute for meat. 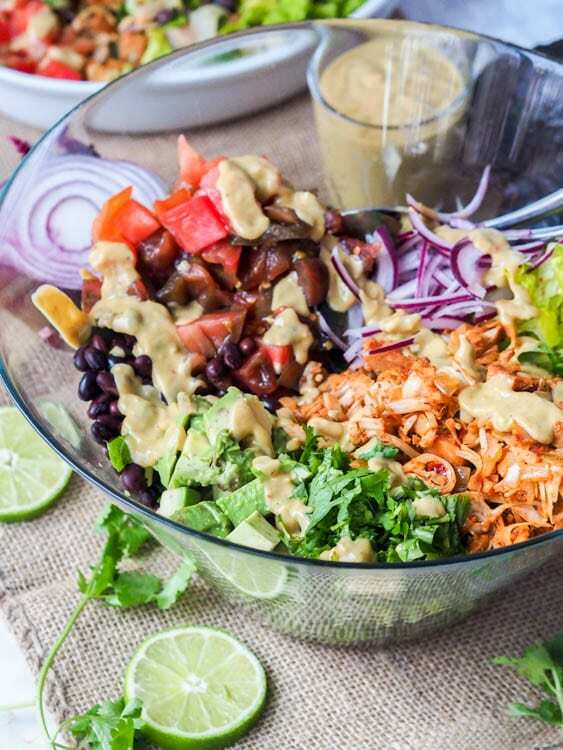 This salad is packed full of vitamins and nutrients with romaine, tomatoes, red onions, avocado, black beans and a super-rich and creamy avocado lime based dressing. Jackfruit pulled pork is the perfect vegan substitute for pulled pork or chicken thanks to its surprisingly meat-like texture, and it’s the perfect addition to this salad recipe. Southwest Salad is the highlight today, but let’s talk avocados. As you already know from my blog name I am a huge fan of avocados. I mean my favorite food of all time is the avocado. If I don’t eat avocados at least a few times a week I become officially sad. Most of the time, your favorite food happens to also not be good for you. Not the case with avocados. If your favorite food is avocados (like me) you have to be feeling pretty good about yourself. 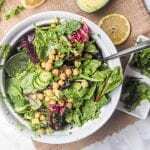 For example, the avocado contributes nearly 20 vitamins, minerals and beneficial plant compounds that can enhance the nutrient quality of the diet. 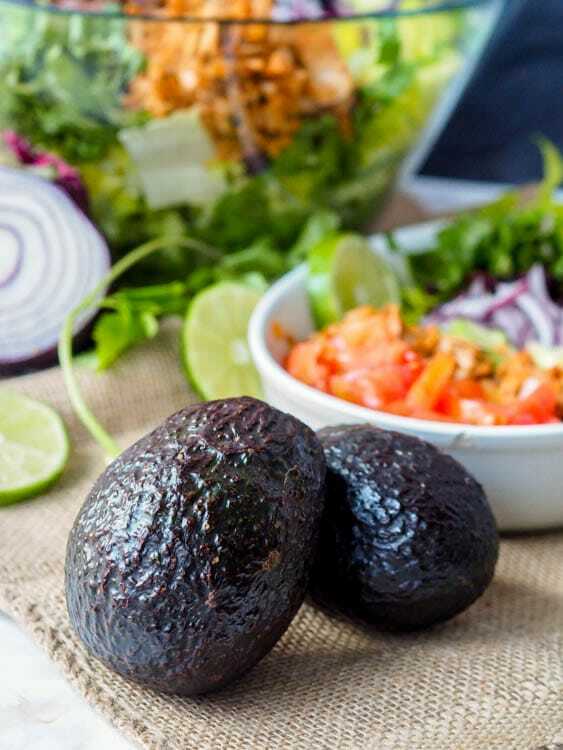 Avocados act as a “nutrient booster” by helping increase the absorption of fat-soluble nutrients like vitamins A, D, K and E, from foods that are eaten with the fruit. Fresh avocados are a heart-healthy fruit. 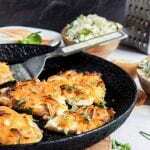 They provide naturally good fats, are low in saturated fat, and are cholesterol- and sodium-free. 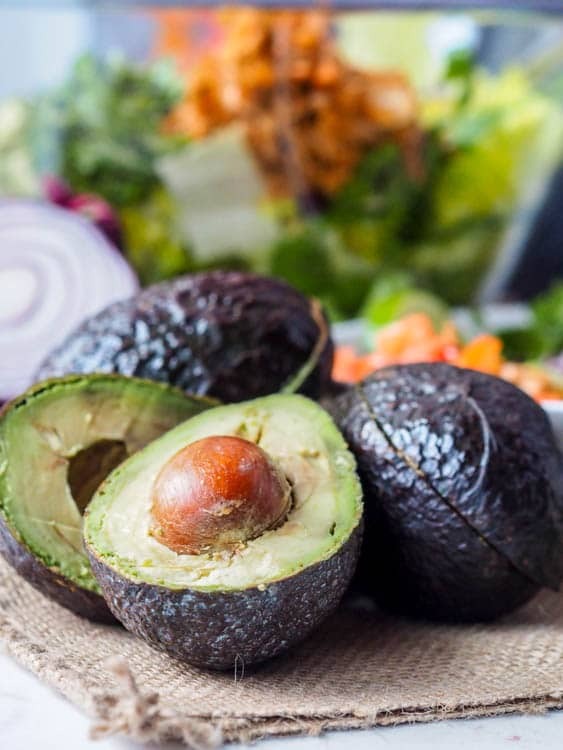 Over 75% of the fat in healthy avocados is unsaturated (monounsaturated and polyunsaturated fats), making them a great substitute for foods high in saturated fat. If that alone doesn’t get you instantly excited about avocados, I do not know what will. 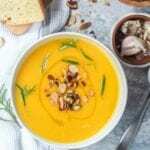 With hearts attacks being the leading cause of death for men and women in the U.S (610,000 Americans die each year from heart disease), it is incredibly important for everyone to start incorporating heart-healthy foods into the daily diet. This is why I could not be happier to partner up with both the Hass Avocado Board (HAB) (the growers of the best and creamiest avocados of all time) and the American Heart Association (AHA) which are teaming up this February to host a recipe contest called Take Avocado to Heart. The contest will run from Feb 9-27, 2017, with the official hashtag #addavocado. Entries must adhere to the AHA nutrition criteria and can be in the categories of appetizer, entrée and dessert. Back in October of 2016 the HAB and AHA planned their four year strategic alliance to encourage American to increase their daily intake of fruits and vegetables in order to limit the deaths from cardiovascular diseases, stroke and diabetes. Heart disease runs in my own family with both my paternal grandfather and great grandfather dying of hearts attacks so this is a topic I do not take lightly. I am a firm believer in diet being a major contributor to disease prevention and will do everything in my power to encourage everyone I know to start eating more avocados more frequently. Since this fruit is so heart healthy and packed full of good fats, all you need to do is add some avocados to your daily diet, be it at breakfast, lunch, dinner or dessert. 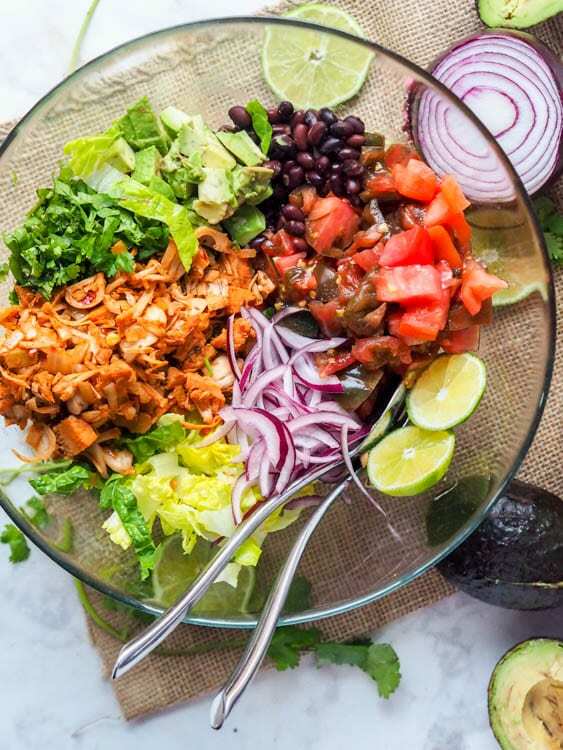 I have no shortage of avocado recipes on my blog and today I’m adding one more – this vegan Southwest shredded jackfruit pulled pork salad with avocado lime dressing. I tried jackfruit for the first time while traveling around South East Asia with my boyfriend back in 2012. It is a large spiky fruit with small yellow edible pods on the inside. They are sweet with a distinct taste. I loved them. Then, in Thailand my boyfriend and I decided to volunteer on a local farm in the mountains, and being vegan, the farmer prepared a vegan jackfruit casserole for us for dinner one night. This wasn’t the same jackfruit though. This had the shredded consistency of pulled pork and super hearty meaty taste. These were not those small sweet yellow pods. I continued to get into an argument with the farmer, assuming there was something lost in translation. I mean, how could this be the same jackfruit? Turns out, it was. To make jackfruit pulled pork, the young green jackfruit is cut up into large chunks and canned in its brine. To cook with it you just need to squeeze it dry, shred it with your hands and allow it to marinate in a medley of spices and herbs before pan cooking. Once I got my hands on some canned jackfruit I knew exactly what to make. First I made jackfruit pulled pork tacos, which were a hit at a dinner party, and then I wanted to make this super hearty vegan Southwest jackfruit pulled pork salad as a dinner salad. As for the other ingredients? I used tomatoes, romaine lettuce, cilantro, black beans, red onions, and avocado. Avocado in the salad alone would not suffice though. 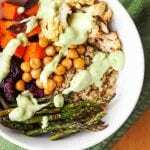 There needed to be a creamy lime avocado dressing to match. This vegan Southwest shredded jackfruit pulled pork salad with avocado lime dressing was a hit. 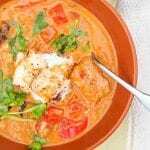 The flavors are all on point and the variety of different textures blend together perfectly. The shredded jackfruit was perfectly marinated in a variety of Southwest flavored spices and pan fried with onions and garlic until lightly crisped up. The creamy avocado lime dressing was the finishing touch on a great salad. Zesty and packed full of tangy lime flavors with that creamy avocado taste peeking through, this dressing might be my new favorite salad dressing. 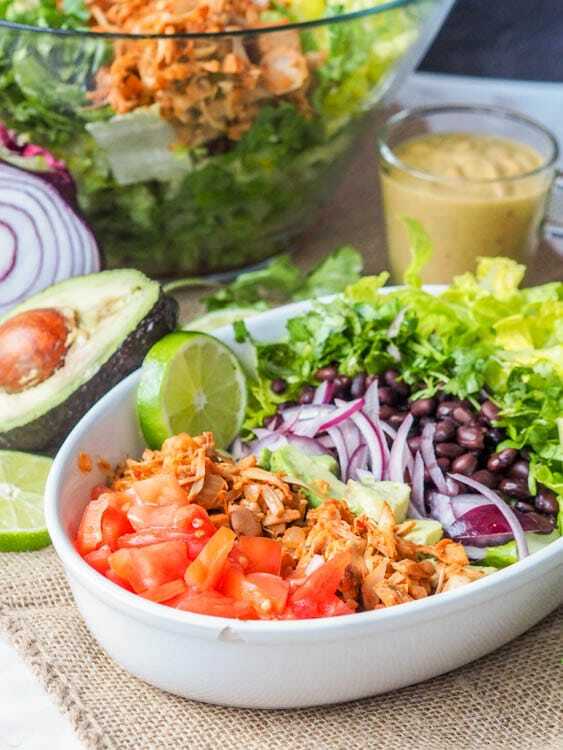 If you’re looking for a new healthy dinner salad recipe, look no further than this vegan Southwest shredded jackfruit pulled pork salad with avocado lime dressing. 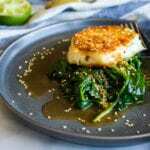 If you’re looking for more recipes that incorporate Hass avocados and are heart-check certified, visit Love One Today to learn more. This shredded jackfruit pulled pork salad would be perfect served with a mimosa with prosecco. 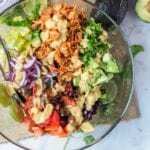 If you’re looking for more salad recipes check out my hearts of palm avocado salad or this vegan gluten free salad recipe round up. A super filling vegan and gluten free healthy and nutritious salad. 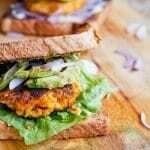 Instead of traditional pulled pork, this recipe calls for shredded jackfruit which makes a perfect plant based substitute. 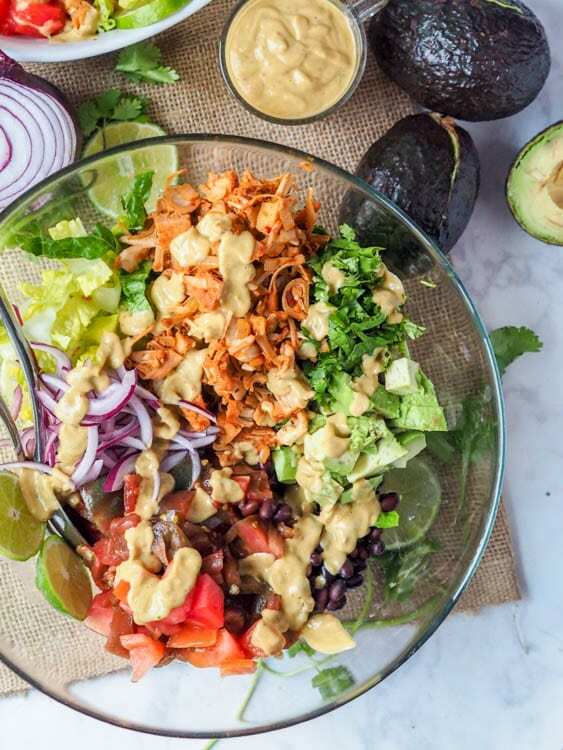 This salad is packed full of vitamins and nutrients with romaine, tomatoes, red onions, avocado, black beans and a super-rich and creamy avocado lime based dressing. In a large Ziploc bag combine shredded jackfruit with cumin, smoked paprika, oregano, onion powder, garlic powder, chili powder, crushed red pepper flakes, vegetable broth and brown sugar. Seal the bag and shake to evenly coat the jackfruit. Let marinate 1-2 hours, or overnight. Heat 1 tablespoon of olive oil in a pan over medium heat and add the diced yellow onion. Cook for a few minutes. Add the garlic. Cook 1-2 minutes. Mix. Add the jackfruit and continue to cook for 10-15 minutes, stirring throughout. 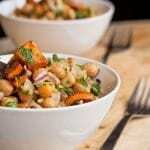 In a large bowl combine romaine lettuce, tomatoes, avocado, cilantro, red onions, and black beans. Toss. 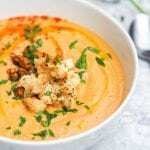 For the dressing, combine the dressing ingredients in a blender and blend until smooth. Add water as needed to thin out the dressing to desired consistency. Divide the salad among 4 bowls. Top each bowl with vegan jackfruit mixture and dressing. Add pepper to taste. 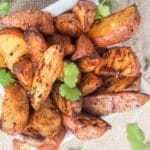 Nutrition Information Per Serving: Calories 360; Total Fat 15 g (Sat 2 g, Trans 0 g, Poly 2 g, Mono 10 g); Cholesterol 0 mg; Sodium 260 mg; Potassium 1260 mg; Total Carbohydrate 52 g; Dietary Fiber 16 g; Sugars 25 g; Protein 10 g; Vitamin A 19200 IU; Vitamin C 43 mg; Calcium 120 mg; Iron 4 mg; Vitamin D 0 IU; Folate 395 mcg. Jackfruit is totally on my list of things to try, so this salad sounds perfect for me! Wow! This sounds amazing! 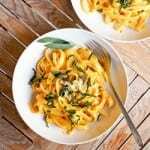 All ingredients that I love so will definitely give it a try. Can’t wait! Thanks for the recipe. Thanks! You’ve got to try this! Oh wow, that’s quite a number of ingredients but I am sure tha this heavenly salad is worth it. 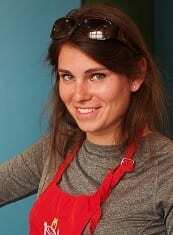 Bookmarking the recipe! 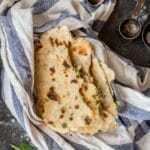 Yes the ingredient list can seem quite long but it is certainly worth it!!! YUM! Avocado is my favorite. I love that you added chipotle in adobo and apple cider vinegar. I haven’t had that combo yet, but sounds amazing! Right?! Avocado is the BEST!!!! Oh, MY: what fantastic travels you’ve had! This salad looks positively vibrant. Even though I’m mildly allergic, I still LOVE avocadoes. I’ll be making this soon! Thanks! So sad that you’re mildly allergic to avocados — that would break my heart! This looks delicious! 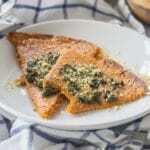 I could see myself using this recipe for lunch throughout the week. Yum! Yes it’s a perfect lunch recipe! This salad looks really interesting. I haven’t yet cooked jack fruit but i think now I should. You’ve got to try cooking with jackfruit, it’s the best! YUM! I’ve heard a lot about jackfruit, but have never had the guts to try it. Hopefully this recipe will give me the motivation I need! Wow, what an unusual and amazing salad ~ I have all the ingredients except the jackfruit! Thanks! You have to get your hands on some canned jackfruit! so I just bought jackfruit for the first time last week. 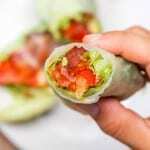 Um… totally trying this and yes to all the goodness of avocado!! Ok you must try this salad then! And highly recommend making tacos out of the jackfruit as well! Avocado is the BEST! This is the perfect way to celebrate heart health month and this is my kind of salad. So colorful and delicious. The avocado lime dressing really brings this salad to life with flavor! I love it! Thanks! The dressing might just be my favorite part! What a gorgeous healthy salad! And that dressing! This is just fabulous… I LOVE jackfruit, but never had them still ‘green’. My dad would make a curry from green jackfruit, but I’ve never tried it… I think I’m ready to give it a try now… Thanks!